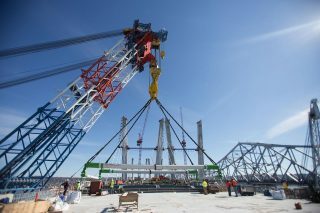 The westbound span of the New NY Bridge is one step closer to coming together – quite literally. Tappan Zee Constructors recently used the I Lift NY super crane to place an enormous, 95-foot-wide steel section to link the westbound Rockland approach span with the cable-stayed main span. The operation began during the early morning hours of February 17 and required the combined efforts of ironworkers and operating engineers. By the early afternoon, the 750,000-pound section was successfully placed on the westbound bridge. Structural steel now connects the main span to the Westchester and Rockland approaches, with stay cable operations continuing on multiple 419-foot towers to help support the steel. More than half of new bridge’s 192 stay cables are now fully connected to the main span towers. Each stay cable is composed of many individual metal strands that are tightly packed together in a protective sheath to provide further strength. Crews added more and more metal strands after the initial installation of the cables to reinforce the connections, with work often continuing to overnight shifts. As work on these sections concludes, the New NY Bridge project team will turn their efforts to the center of the main span, where the final connection will be made between the westbound towers in the coming months. Following this operation, the westbound span will be physically connected with structural steel from Rockland to Westchester counties.